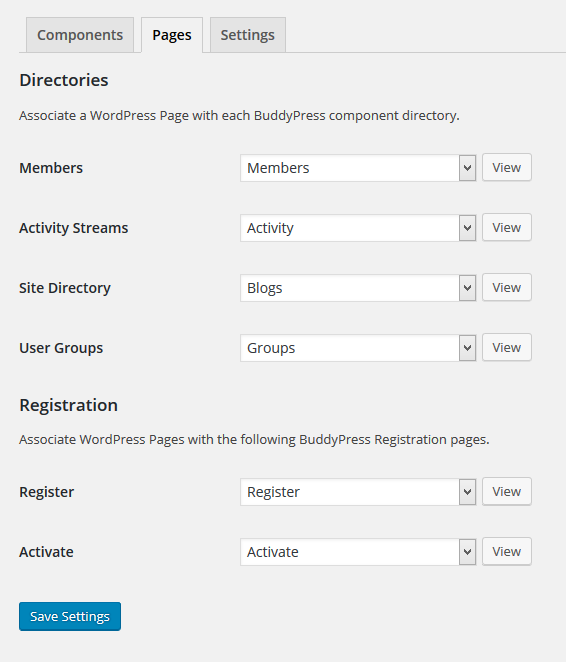 ERROR MESSAGE:The following active BuddyPress Components do not have associated WordPress Pages: Activate, Register. https://codex.buddypress.org/getting-started/register-and-activation-pages/ At the bottom of this page it show you the Assign the Pages section once you assign the page you have an option to Save or View? I dont have that option and there for keep getting the above error message? I have tried to deactivate delete and reinstall plugin but nothing is working? > I meant how do I disable registration? Go back to where you enabled it in Settings > General for single site or in Network Admin > Settings if you’re on multisite. The topic ‘Save Button Not Showing?’ is closed to new replies.